Bowie the rock star here! I am a gorgeous and extremely friendly 1-year-old boy with a very unique condition called heterochromia which just means that I have two different-colored eyes! I can see perfectly out of both, and the condition doesn’t cause me any issues — it only enhances my already smashing appearance. Even though I’m very new here at Pixie, I’ve already shown that I’m a confident, affectionate, and curious guy that would do great in a busy home with lots of action! I’m very tolerant of being handled, picked up, pet, and played with — I even seem to enjoy car rides and will start to “make muffins” with my paws when I hear my namesake David Bowie on the radio! Although I can’t sing like the late Ziggy Stardust, I think I’m just as adorable and my star quality is a sure thing. I am currently in excellent health, but I am positive for Feline Immunodeficiency Virus, which just means that I will need to be an indoor-only cat and that I will need to have regular vet exams to ensure that I stay healthy and happy. Cats with FIV can live long and healthy lives just like other cats, and do not need regular medication or special food. 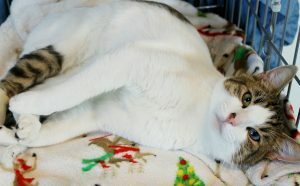 For more information on FIV, check out this article from the Cornell Feline Health Center: http://www.vet.cornell.edu/fhc/Health_Information/brochure_fiv.cfm. Are you looking for a fun, fabulous, furry friend like me? I think we were meant to be! Let’s fall in love together, just in time for stormy weather! 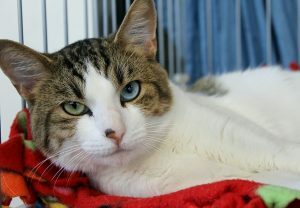 I’m currently living at Pixie, and I come to you fixed, vaccinated, and micro-chipped for an adoption fee of $100.